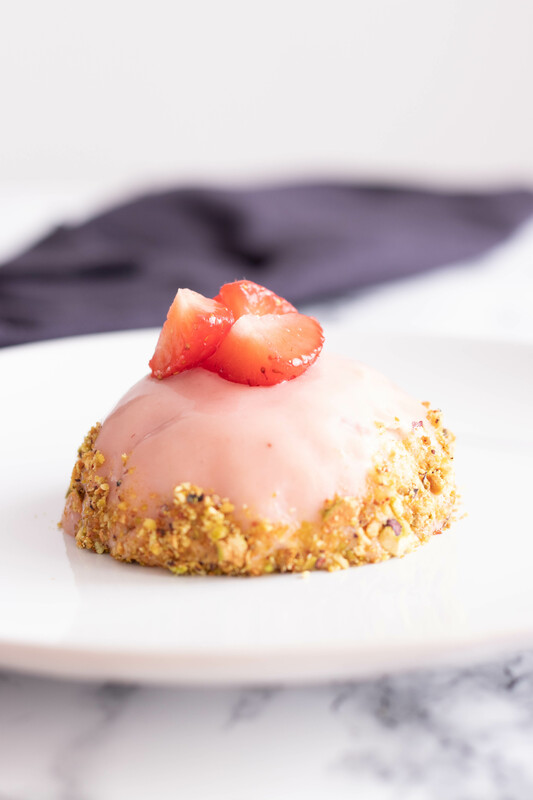 Strawberries season is definetly my favorite season of the year and my favorite way to it is definetly raw but some quick fresh strawberries desserts every now and then never hurts . Last week i was organizing my cupboard and i found some ladyfingers biscuits letf from the last tiramssou i made and told myself why not recycle it into something easy to prepare for the next day . Well i actually went for a fancy looking dessert as well but trust me it is so easy to make it only needs some time to rest in the fridge so patience will be your best friend otherwise the whole preparation last at most 20 minutes . Then in a separate cold bowl ( place it in the fridgre 15 min ahead ) start whisking the heavy cream to get a Chantilly and set in the fridgre to cool down . Now that your puree and chantilly are cold mix them gently together and return it to the fridge to cool down . Second in a silicone mold of your chouice place the mocsse first then some freshly die d strawberries and finally some ladyfinger biscuits pieces. Place the mold in the fridgre for at least 4 Hours or overnight . Now it's time to prepare our glaze , on a bain marie place the white chocolat and let it melt then place it aside and stir in the strawberries jam ,after sifting it to get rid of any lamps , finally add the condenced milk and mix with a spatula to prevent air bubbles from forming into your glaze . Finally , get out your molds and release the mousse place it on a baking grill and pour the glaze on it gently , make sure to cover the edges as well . Replace it in the fridge until you the glaze sits and you are ready to eat it. Then decorate it with fresh fruit and/or nuts .